AGILENT Technologies has released design tools enabling RF and baseband engineers working at the physical (PHY) layer to create, analyse and troubleshoot orthogonal frequency-division multiplexing (OFDM) signals specified in the IEEE 802.16-2004 standard, often referred to as WiMAX. The IEEE 802.16-2004 standard specifies air interfaces for broadband wireless access (BWA) systems. It can open many opportunities to deploy systems in applications that were previously cost-prohibitive. WiMAX enables multiple services in a wireless metropolitan area network, such as wireless backhaul for telecommunications, high-bandwidth/high-reliability remote connectivity, E1/T1 replacements for small and medium-size businesses, and residential wireless DSL. 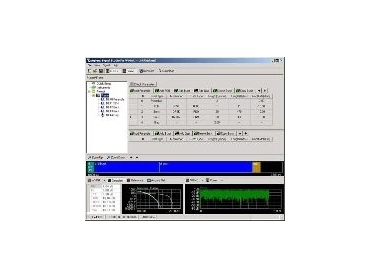 Agilent's tools for designing and testing WiMAX components, subsystems and systems includes Signal Studio for WiMAX (E4438C option H13) and the 89600 series vector signal analysis software (option B7S OFDM modulation analysis). The company also produces the PSA series spectrum analyser with an 80MHz digitiser (option 122) and the Advanced Communications Model Set in Advanced Design System (ADS) 2004A. Signal Studio for WiMAX software allows component designers to generate IEEE 802.16-2004-compliant signals for component test applications. It also allows users to select WiMAX signal parameters such as bandwidth, cyclic prefix ratio (G), sampling factor (n) and frame length to configure both downlink or uplink frames. The Advanced Communication Model Set for ADS 2004A provides modelling components that help designers create WiMAX-compliant signals and simulate OFDM base systems such as WiMAX, WiFi and ultra-wideband (UWB). The Agilent 89600 VSA software option B7S OFDM modulation analysis enables thorough demodulation analysis and troubleshooting of OFDM PHY layer signals when combined with digitisers including VSA, ESA and PSA spectrum analysers, 89600 VXI signal analysers, and Infiniium oscilloscopes. The software handles all WiMAX bandwidths with auto-detection of all modulation formats, plus measurement of all signaling formats, frame lengths, guard intervals and sampling factors. Used with the Agilent E4440A PSA spectrum analyser, engineers can capture and analyse signals with up to 80MHz bandwidth.